How do you explore the blockchain while on-the-go? The answer will be, use the phone. If you plan to go through the blockchain on a mobile device and happen to have an iPhone, then there is one tool which will come in handy. BlockJockey is a bitcoin blockchain navigator and info tool created by Gryphos GmbH that helps people understand bitcoin and its underlying technology. Gryphos GmbH, the German firm based out of Hamburg has released the latest version of the BlockJockey blockchain explorer tool. The latest version (ver 1.1) has received a lot of upgrades to offer a more intuitive and interactive experience to the users. Users can now access geographical data for full nodes on the bitcoin network, displayed on an interactive map. It also allows them to filter and display full nodes for a specific geography or location. BlockJockey, in its latest form offers detailed information about bitcoin network to its users. They can navigate through a treasure trove of information, in a fun way to understand how bitcoin network has currently spread across the globe. By using BlockJockey, one can navigate through the blockchain, accessing detailed information from block headers. If anything interesting catches the eye while navigating though the blockchain, one can always bookmark it for later study. Any new blocks created on the bitcoin network will get automatically updated on the application while it is still in use. Apart from information on blockchain, the application also offers real time statistics of bitcoin price, trading volume, market capitalization, transaction volume, miner’s revenue and mining power. Putting all these together, the application offers complete run down of blockchain and bitcoin network for users, all at their fingertips. 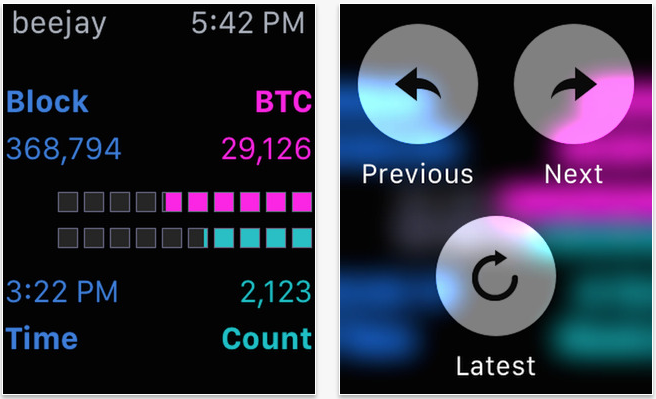 BlockJockey application can be installed on iPhone and Apple Watch for $1.99 USD. It works with these devices running on iOS version 9.0 and above.